A design classic from Rupert Oliver’s early design collection (about 1967 – we have the proof!) which has stood the test of time. Some of the earliest versions are still available for a small fortune on the internet if you search the classic furniture sites. The Leaf Chair is the most comfortable, single point of suspension chair ever designed; you will never feel more relaxed in any other chair. 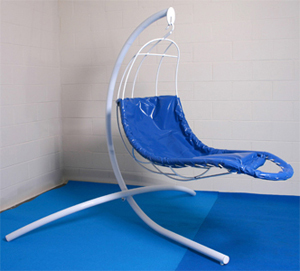 Steel framed, either galvanised, plastic coated or powder coated, it can be padded with a PVC seat for outdoor garden or remedial use, or why not treat yourself and ask us about a quality leather seat for your home interior. Standard finish is white powder coated. Competent building advice to be taken on fixture as Ceiling Mounted Bracket will only hold a maximum of 100 kg. For ceiling suspension a Rotational Safety device must be used. A stand or a special corner stand is available if ceiling suspension is not practical for you, overall dimensions 2.1m x 1.60m.